After Algeria (May 17-21) and Tunisia (May 25-29), the “training of trainers” phase of the SWITCH-MED project (United Nations Environment Programme, UNEP/MAP – SCP/RAC) arrives in Morocco (June 8-12), seeking to contribute to the development of a strong ecosystem for eco-entrepreneurship & green business in the country, and link it to the whole Mediterranean network promoted by SWITCH-MED. The local partners leading the work on the ground, contextualizing it within the framework of the national strategy for a Green Economy, and selecting the trainers are the “Fondation Jeune Entrepreneur” -FJE- (Young Entrepreneur Foundation), and the “Réseau Marocain de l’Économie Sociale et Solidaire” -REMESS- (Moroccan Network of Social & Solidarity Economy). Family picture from the Eco-entrepreneurship Training of Trainers in Morocco (June 8-12, 2015), with Jesus Iglesias from Greenbiz and Ariadna Benet as SWITCH-MED trainers, Loubna Chafai from REMESS, and Rida Lamrini from the FJE, among other participants. >Once again, we had the pleasure to share an enriching week of practice with experienced colleagues coming from a variety of backgrounds and sectors, private and public alike. Through a hands-on, group-based approach applied to local business cases, we empowered the trainers on UNEP’s Eco-entrepreneurship Methodology, prepared the work ahead regarding its adaptation to the Moroccan context, and began organizing the training of eco-entrepreneurs set to begin in the fall. All while exchanging experiences and best practices, assessing the country’s ecosystem and its potential green niches, connecting networks, and building partnerships for the future. The highlight of the week was without a doubt Rida Lamrini‘s (FJE’s founder) vision for an entrepreneurial Morocco, where every youngster will have the opportunity to undertake her or his business idea, provided it creates environmental and social value. To achieve that vision, Rida emphasized the need to develop a vibrant ecosystem of actors, capable of delivering the necessary resources (funding) and services (training, coaching, and follow-up) to the aspiring eco-entrepreneurs. The comprehensive roadmap he outlined, builds on the momentum initiated by SWITCH-MED, and takes it to the next level by creating an “army of trainers” specialized in Eco-entrepreneurship; and capacitating public institutions, large companies and civil society organizations to jointly contribute to the Green Economy. Next stop along the road: MEDLab Entrepreneur (November 2015), a 2-day congress filled with workshops, seminars, trainings, networking and all sorts of events, aimed at propelling a great amount of young eco & social entrepreneurs into stardom. 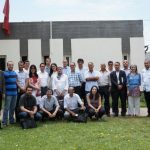 Falling right in the midst of the actual training of eco-entrepreneurs (september – decemeber 2015), MEDLab represents the perfect occasion to assess the state of the art of the program, exchange best practices and gauge next steps, and far more, the launch pad for a green and undertaking Morocco. From our side, we will certainly attend and actively participate in MEDLab, as it is our wish to engage in these promising times for Morocco and its people. Photos courtesy of REMESS (“Réseau Marocain de l’Économie Sociale et Solidaire”).